Selenium makes code maintenance simpler and code readability better. Learn about the three most commonly used Selenium frameworks. In this article, I will tell you how to use a Selenium framework to optimize your code structure. What Is a Selenium Framework? The Selenium framework is a code structure for making code maintenance simpler and code readability better. A framework involves breaking the entire code into smaller pieces of code that test a particular functionality. The code is structured such that the dataset is separated from the actual test case that will test the functionality of the web application. It can also be structured in a way in which the test cases that need to be executed are invoked from an external application (like a CSV). These frameworks will be discussed with a demo in this article. But before going any further, let me tell you why a Selenium framework needs to be in place and what benefits you will get out of using one. Why Do We Need a Selenium Framework? Without a framework in place, there will be one test case that will comprise the entire test functionality. The scary part is that this single test case can have up to a million lines of code. It's pretty obvious that a test case so huge would be tough to read. Even if you want to modify any functionality later, you will have a tough time modifying the code. Since the implementation of a framework will result in smaller, multiple code pieces, there are various benefits. Now that you know the basics of frameworks, let me explain each of them in detail. 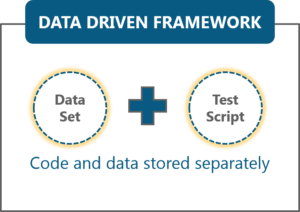 A data-driven framework in Selenium has the technique of separating the dataset from the actual test case (code). This framework completely depends on the input test data. The test data is fed from external sources such as an Excel file, CSV file, or any database. Since the test case is separated from the dataset, we can easily modify the test case of a particular functionality without making wholesale changes to your code. For example, if you want to modify the code for login functionality, then you can modify just that instead of having to also modify any other dependent portion of the same code. Besides this, you can also easily control how much data needs to be tested. You can easily increase the number of test parameters by adding more username and password fields to the Excel file (or other sources). For example, if I have to check the login to a web page, then I can keep the set of username and password credentials in an Excel file and pass the credentials to the code to perform automation on the browser in a separate Java class file. WebDriver does not directly support reading of Excel files. Hence, we use Apache POI for reading/writing to any Microsoft Office document. You can download Apache POI (a set of JAR files) from here. Download the ZIP file or TAR file as per your requirements and place them along with the set of Selenium JARs. The coordination of the main code and dataset will be taken care of by TestNG Data Providers, which is a library that comes as a part of the Apache POI JAR files. For demo purposes, I have created an Excel file called LoginCredentials in which the usernames and passwords have been stored in different columns. Take a look at the below code to understand the test case. It is a simple code for testing the login functionality of a flight-booking application. As you can see above, we have a method named TestDataFeed(). In this method, I have created an object instance of another class named ReadExcelFile. While instantiating this object, I have fed the path of my Excel file containing the data. I have further defined a for loop to retrieve the text from the Excel workbook. But to read the data from a given sheet number, column number, and row number, the calls are made to the ReadExcelFile class. The code of my ReadExcelFile is below. First, note the libraries I have imported. I have imported Apache POI XSSF libraries, which are used to read/write data to Excel files. Here, I have created a constructor (object of the same method) to pass the values: sheet number, row number, and column number. To understand this framework better, I request you to go through the below video, where I have explained this in a structured manner. In keyword-driven frameworks, all the operations and instructions to be performed are written separately from the actual test case. It is similar to a data-driven framework in that the operations to be performed are again stored in an external file like an Excel sheet. The operations I'm talking about are nothing but the methods that need to be executed as part of a test case. The benefit of keyword-driven frameworks is that you can easily control the functionalities you want to test. You can specify the methods that test the functionality of the application in the Excel file so that only the method names specified in the file will be tested. For example, for logging into a web application, we can write multiple methods in the main test case, in which each test case will test certain functionality. For instantiating the browser driver, there could be one method for finding the username and password fields, there another method for navigating to a web page, etc. Take a look at the below code to understand how the framework looks. The lines that are commented out serve as an explanation if you don't understand. As you can see, the different functionalities that need to be tested are present in separate methods waiting to be called. Now, these methods will be called from another Class based on the presence of the method name in the Excel file. Similarly, to read the Excel file and send back the results, I have written another Class. Both of them are displayed below. Now, let's move on to the final part of this Selenium framework article, where I will show you how to build a hybrid framework. 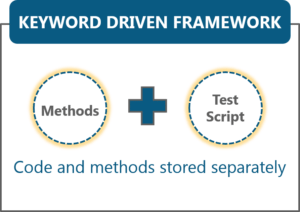 With a hybrid framework, we can make the best use of both data-driven and keyword-driven Selenium frameworks. Using the examples shown above, we can build a hybrid framework by storing the methods to execute in an Excel file (keyword-driven approach) and passing these method names to the Java Reflection Class(data-driven approach) instead of creating an if/else loop in the DriverScript class. Take a look at the modified DriverScript class in the below code snippet. Here, instead of using multiple if/else loops, a data-driven approach is used to read the method names from the Excel file. //This will load all the methods of the class 'Actions' in it. To better understand the concept of data-driven, keyword-driven, and hybrid frameworks, watch the below video. I hope this article was useful to you and gave you a clear understanding of what a Selenium framework is, how it is beneficial, and how to build your code structure using these three Selenium frameworks. Stay tuned for more articles in this series. Is 2019 The Year When Organizations Will Benefit From Data? Published at DZone with permission of Vardhan S , DZone MVB. See the original article here.